Are you going on holiday to Italy? Looking forward to sampling some of the delicious food in Italy? Our guide to Italian food gives you the facts & information you want to know. It is very difficult to talk about national food in Italy because the various regions of Italy are so different. 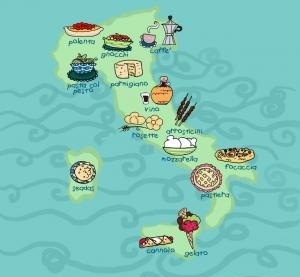 Generally, each region of Italy has its own particular types of food although there are some staple foods which are eaten more or less across Italy. Pasta, risotto and olive oil all feature heavily in Italian food. Breakfast is not a major meal of the day in Italy and the only food eaten by most Italians for breakfast will probably be some type of pastry accompanied by a quick cup of coffee. Lunch is the main meal of the day in Italy where copious amounts of food are served. A typical Italian lunch in an ordinary Italian household can be a several course affair with different types of food being served with each new course. The bulk of food eaten at lunch usually consists of pasta followed by some type of meat dish often with a side helping of salad. Although eating sweet foods for dessert in Italy is not an absolute must, many Italians will finish off their lunch with some type of sweet dish or fruit. Dinner in Italy usually involves the same type of food that was eaten at lunch except on a smaller scale. Dinner in Italy usually consists of either a quite light meal, or something like meat and pasta but with smaller portions than served during lunch. The food found in the North West regions of Italy that border France such as Piedmont closely resemble the food eaten in France. Amongst the typically French ingredients that are included in the food of this part of Italy are frogs and snails. The Piedmont region in Italy is also famous for its truffles, which are an exquisite delicacy that can fetch high prices with food connoisseurs. Similarly, the regions of Italy in the North East that border Austria have clear Austrian influences in their food. The Trentino Alto Adige region of Italy is particularly known for serving up heavy broths and smoked meats. The north of Italy has very rich soil and a climate that is favourable to agriculture, making it one of the best places for the freshest ingredients for cooking Italian food. The Liguria region of Italy which looks onto the Liguria Sea is home to some of the best olive groves in the world. Understandably, olives and olive oil feature heavily in the food of this region of Italy. Slightly further east into the Lombardy region of Italy, people tend to prefer eating risotto to pasta and favour butter over olive oil in their cooking, perhaps due to the influence of the food of neighbouring Switzerland. Food in the South of Italy relies more heavily on sea food due to its proximity to the fishing waters of the Mediterranean Sea. Swordfish steaks are a speciality on the food menu of Sicily, while roasted pig is a typical food found on the other Italian island of Sardinia.